I am new to Mac but am seeking to design a brochure for printing using the Pages app. The normal color settings of RGB and CMYK do not seem to be present. What color setting do I need to use to obtain a CMYK "true black"? Pages simply isn't designed for professional commercial printing. If you need to control your output for commercial offset printing you're better off using something like Adobe Illustrator or InDesign. If you're printing the brochure yourself or using a digital printing service then you may be better off working in RGB and letting the printer do the conversion for you. It seems this is a per-object setting though, not per document. But, I cannot in any way with any settings get the PDF to output with the correct CMYK values—Pages always converts your colors somewhere in the process. 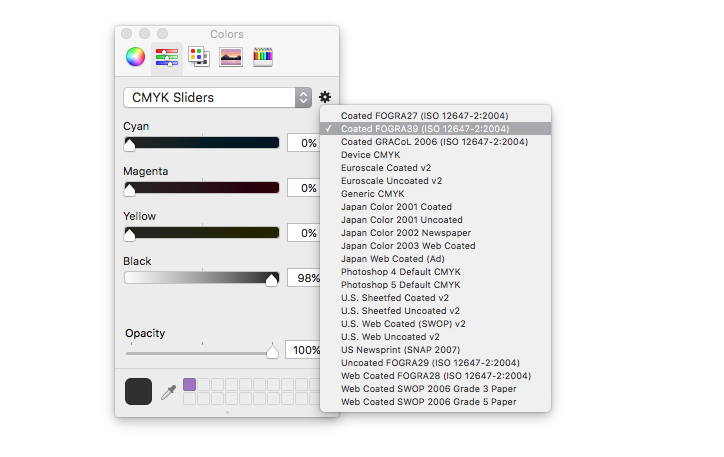 The only other option is to use something like Adobe Acrobat to convert your colors after exporting your PDF (using either Preflight or the Convert Colors tool). Not the answer you're looking for? Browse other questions tagged color print-design color-spaces black or ask your own question. What black should I use when printing on a metal tin? How to convert CMYK combined black to true black in Illustrator?